Tag Archives: interior designs hallway. 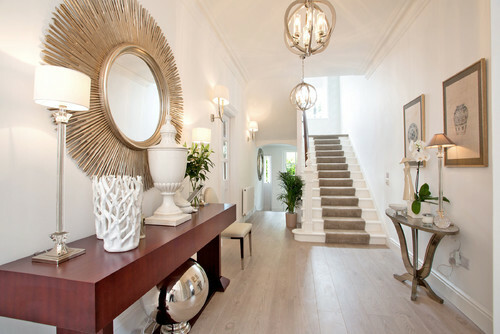 5 Top Tips to Style out any Hallway. 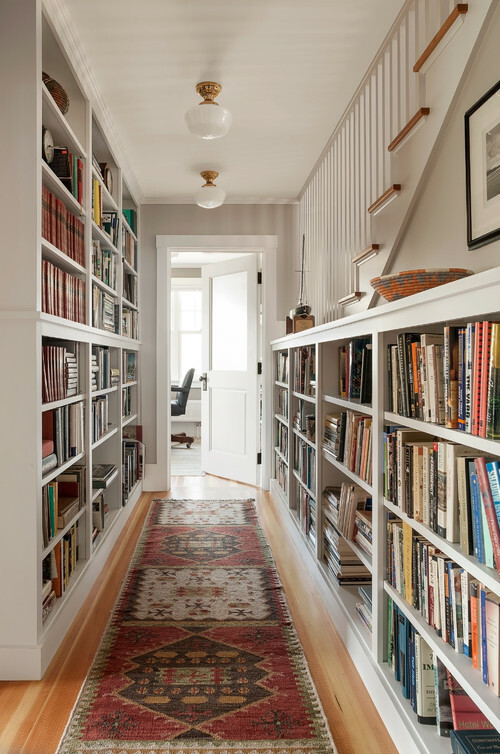 Is your hallway tired looking, dark, and cluttered? 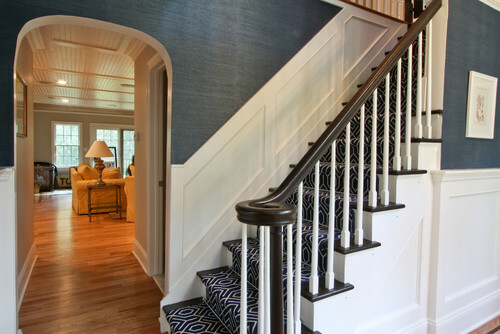 Are you looking for ways to spruce it up so that your hallway will impress your guest and regain style. Well, look no further, we are going to dive into must have’s to create drama and make your hallway the talk of the town. 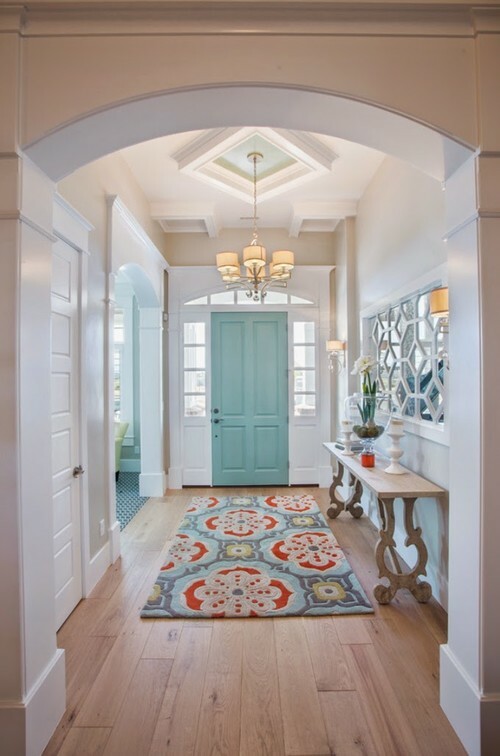 Your entrance hallway is the first place your visitors are going to see once they enter your home. Your hallway, gets so much traffic that it is important to not only make it a stylish welcoming place for your home but also a place where dirt from shoes and clutter are not dumped. 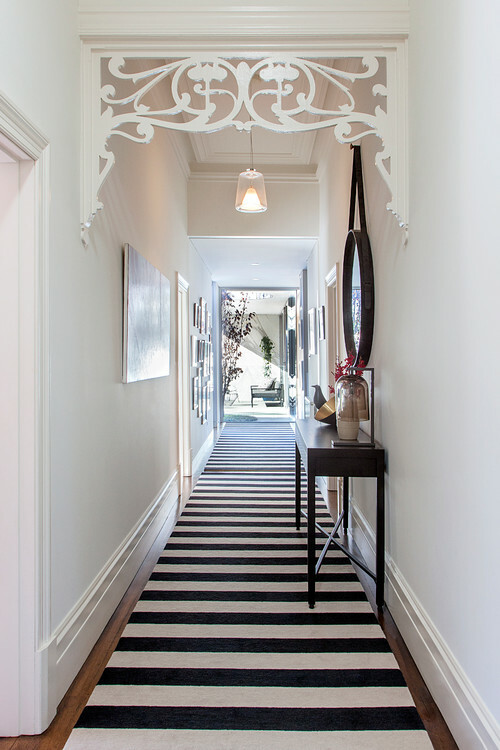 Your hallway speaks volumes about your house, you can know a cluttered house from the way the hallway is presented. Also if you are greeted with a beautiful hallway, it sums up the impression you give of the rest of the house because you know that if the hallway is very well presented then the rest of the house must be great. We are going to discuss ways to liven a dark entrance and make it more impressing, each tip discussed should be used with your personality and personal style in mind so your entrance speaks true to you. 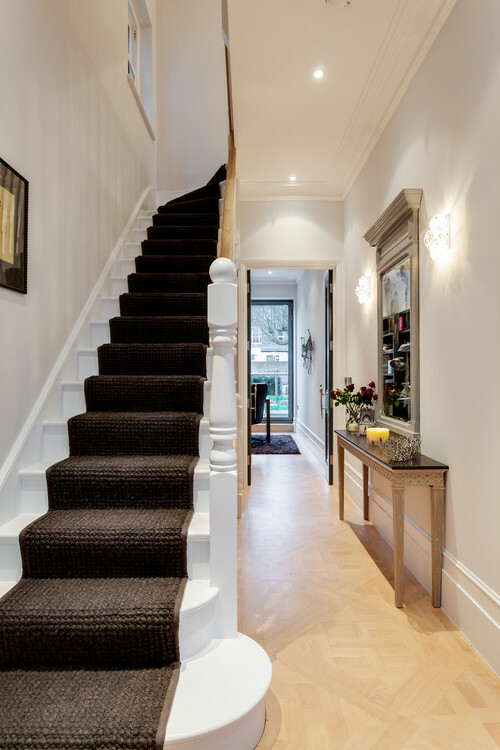 If you have been dealing with a cluttered hallway, or a tired dreadful hallway and you are looking for ways to make your entrance grander, stylish and welcoming, then keep reading because I am going to share with you 5 must have tips to style out your hallway. 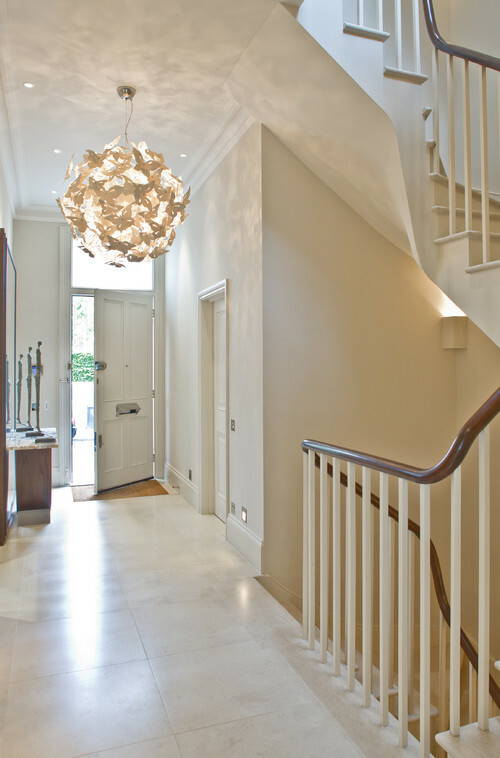 We are going to look at making the most out of a small entrance hall and getting the best out of a bigger entrance hall. 1. Mirror: Mirrors create a classic statement and gives a dramatic impact. 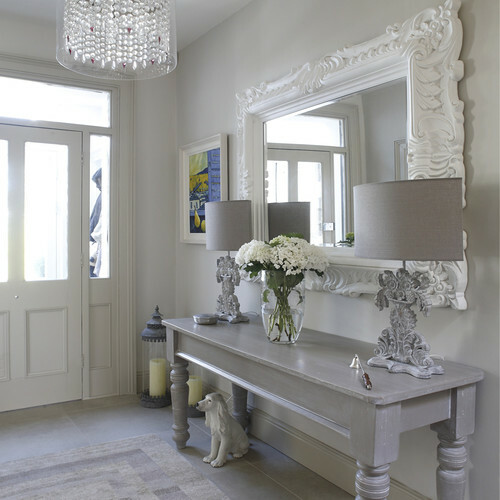 Mirrors also reflect light which makes your hallway seem bigger if you have a narrow entrance. Not only that, having a mirror at the entrance functions well to your favour as you can always have one last look at yourself to ensure everything is in place before dashing out. If you have a bigger space to play with, the better, placing a dramatic mirror as the main focal point of your entrance will add drama and beauty to your space. 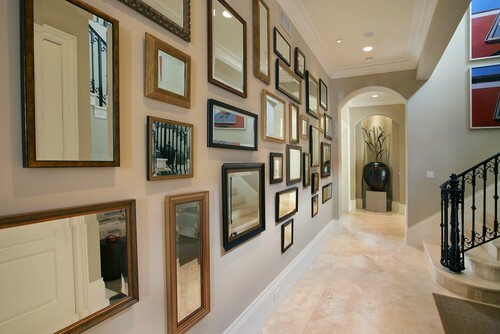 Not only that if you have arts or pictures on the wall, the mirror reflects them. If your entrance is small go for a smaller but dramatic mirror that will fit with the whole setup of your entryway, if you have more space to spare then dare to go big and make your mirror the focal point. Another tip is to use several mirrors and frames hung on one side of the wall to create effective art and to stream light in. Below are image samples of the effects of mirrors in a narrow and large hall entrance way. 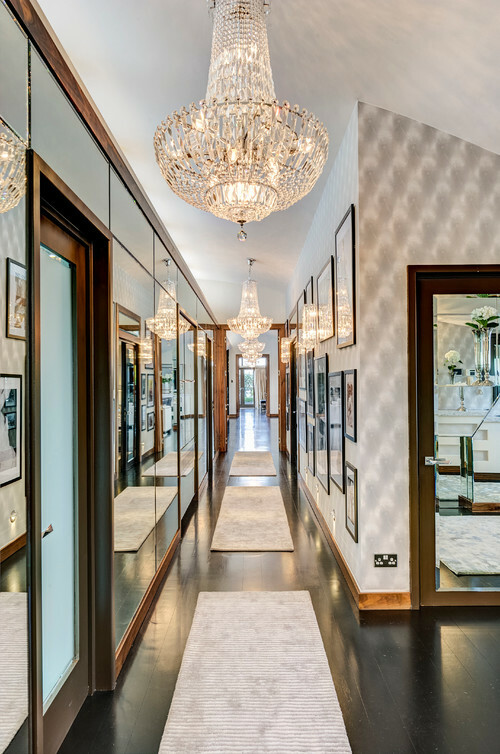 Dramatic and Must Have Hallway entrance mirrors. Neutral colours are best and more inviting for a stylish classic and inviting entrance way. However, some people prefer darker colours. to make darker colours on your walls work well for you, it has to contrast with everything else in that space. For example if you have black walls then keep the door crisp white and the line straight. If you want to only paint the walls, then choose your colours wisely, because darker colours tend to make darker hallways. 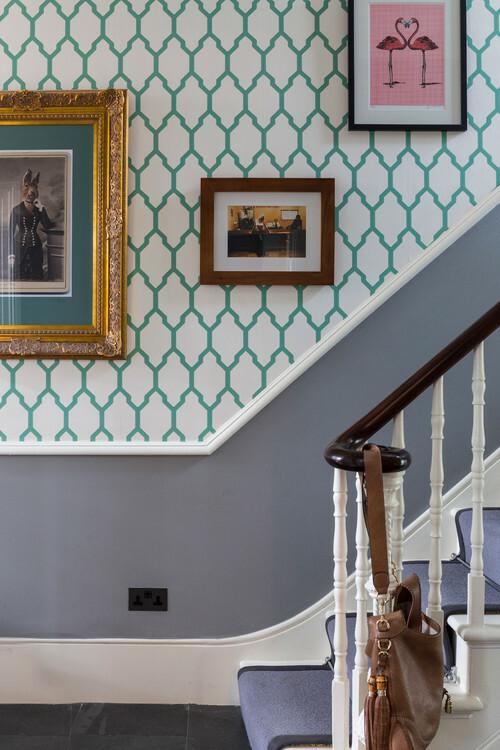 If you are looking to wall paper your entrance hall, how about just papering one side of the wall alone, doing two walls in the same colour or pattern can make your hallway seem very busy and not as classy. You could also consider painting your walls in a colour of your choice and then adding framed large wall panels with a wallpaper of your choice as the focal point that is, if you have the space. Doing this will create and give a luxurious and opulence feel to your entrance. To successfully do this, ensure your walls are painted in a neutral colour, so you can contrast it with a darker coloured panelled wallpaper or vice versa. Below are sample images of neutral coloured painted hallways and wall papered hallways. Wall paper inspiration ideas, click on image for price. 3. 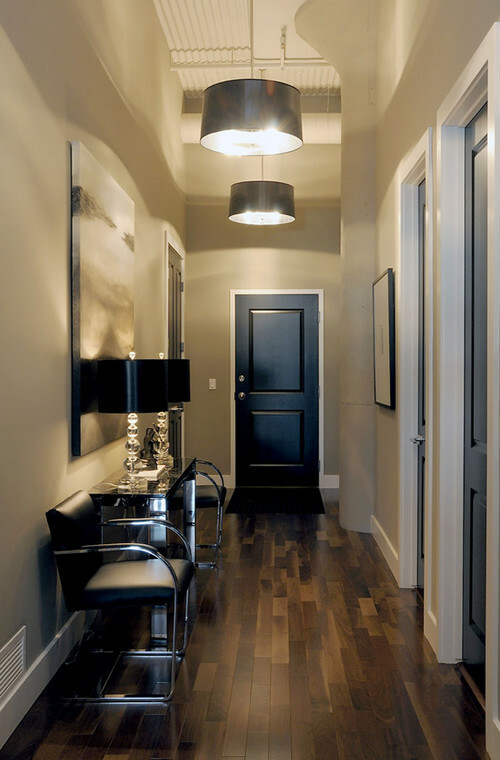 Lighting: Hallway lightning is very important to the overall setup of your hallway, not only as a functionality but also a statement piece. As you know, first impression counts so your light should be all about wowing and making your guest gasp. If you have the space and height, then, placing a chandelier that cascades down into your hallway, big enough to make an impact speaks of luxury and opulence. However, if you don’t have the height and space then a repetitive ceiling light pattern might be the way to go to create drama. not have windows, so ensure you have enough light to brighten and light up your hallway. All in all, do not forget to choses a light that is in keeping with the style of your home. 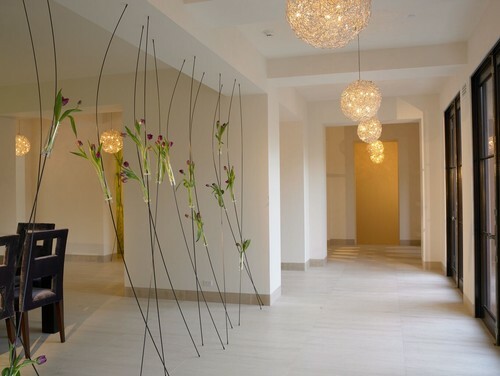 Must have Lighting Hallway inspiration ideas, click image for price. 4. Rugs, Runners or Tiles: Whichever one you are thinking of going for should not only be durable and stylish but easy to clean as well. 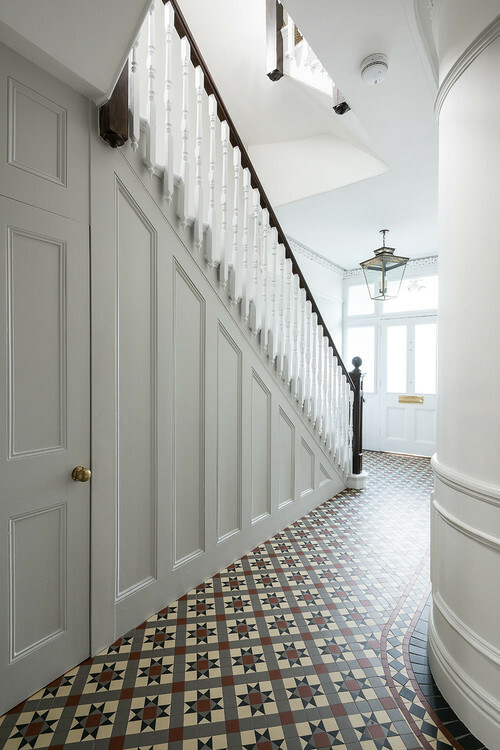 If everything else is neutral, or too dark add colour to your hallway by either using a colourful tile for drama or a bright rug to brighten up your entrance and make it more inviting. The rug or tile you choose could also act as a connector to other designs in the rooms leading into your hallway so choose carefully so that it ties in with the overall setup of your home. 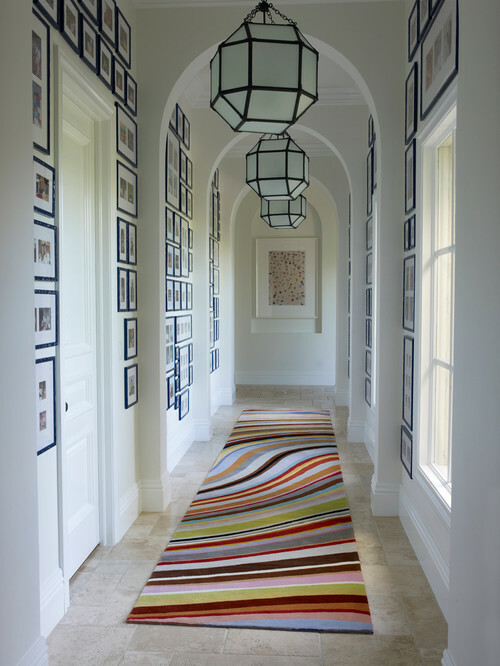 Putting rugs in your hallway generally warms up your space, making it more intimate. 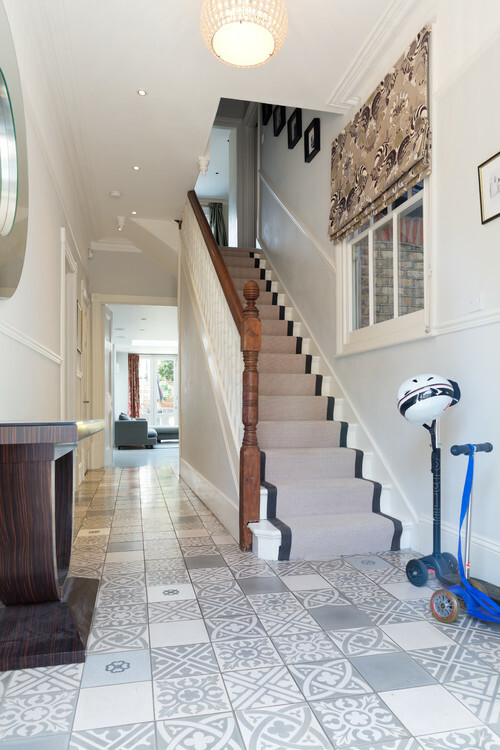 For tiles, use patterned tiles and tie the colour in with your theme or stair carpet to create an impactful stunning entrance. Note if you are using patterned tiles, it is important to keep your walls simple so that your floor can become the focal point. As you know, too much of everything is bad, so keep it classy and tasteful. Also remember if using tiles, that tiled floors can become slippery when water accidentally pours on it or if wet shoes and umbrellas are allowed to spill on the floor so ensure your tiles are dry at all times to avoid accidents. 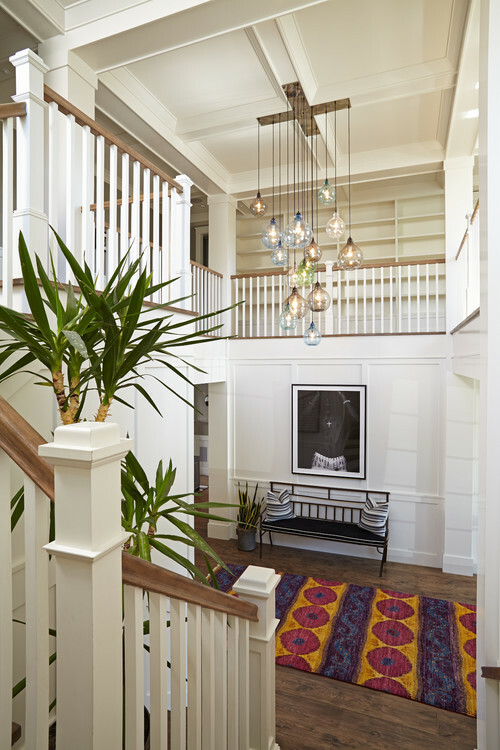 Photo by Pleysier Perkins – Look for contemporary hallway and landing pictures. 5. Console tables: Console tables are important additions to any hallway. If you have a very narrow hallway, use a slim console that doubles as a storage system underneath to hide away slippers and shoes. Console tables are useful for keeping unopened letters, keys, hallway telephones, vases for decoration and even a table lamp. If you can’t get a console table with storage, it’s alright, just get yourself a basket that fits under it, to house all your stuff away. 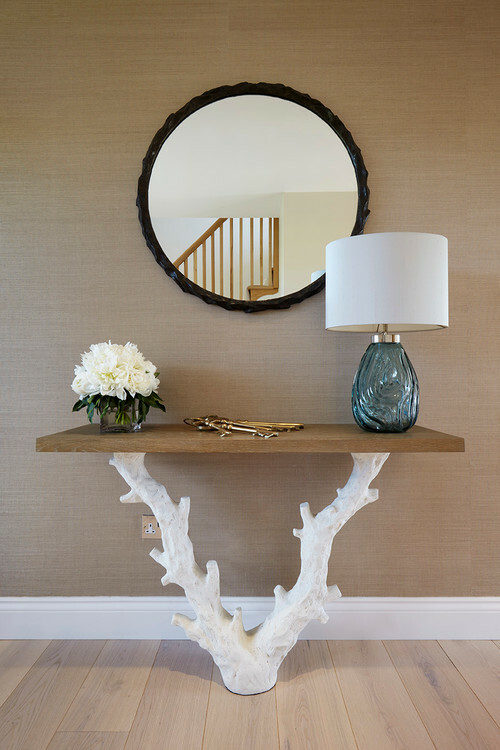 Every console table should be carefully placed under a stunning mirror or art work for visual effect and uniformity. If you have more space to play with then, splurge on a thicker and more dramatic console. Hallway console inspiration ideas. Click image for price. 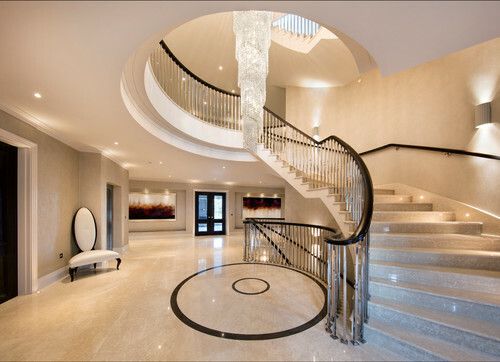 entrance hallentry wayHallwayinterior decorinterior designs hallway.